Kumaraswamy, who was part of the TMC-led mega opposition rally held in Kolkata on Saturday, said that Banerjee has the abilities to run the country. Bengaluru: Amid the BJP attacking the opposition’s proposed grand alliance over the issue of prime ministerial face, Karnataka Chief Minister H D Kumaraswamy on Monday heaped praise on his West Bengal counterpart Mamata Banerjee, saying she is a “good administrator” and has all capabilities of leading the country. He, however, maintained that leadership was not the pressing issue at hand and that the opposition needs to focus on ways and ideas and win the upcoming Lok Sabha elections. “According to me, deciding on the leadership is not a criterion to win the polls. People of the country are totally disappointed with the administration of Narendra Modi. Several states have their own problems. It is not necessary to select a leader before the elections,” Kumaraswamy said. “There are effective leaders, who can move in a big way for the development of the country. They can make headway in areas where the previous governments have failed. But we can sit and select our leader after the elections are over,” he added. 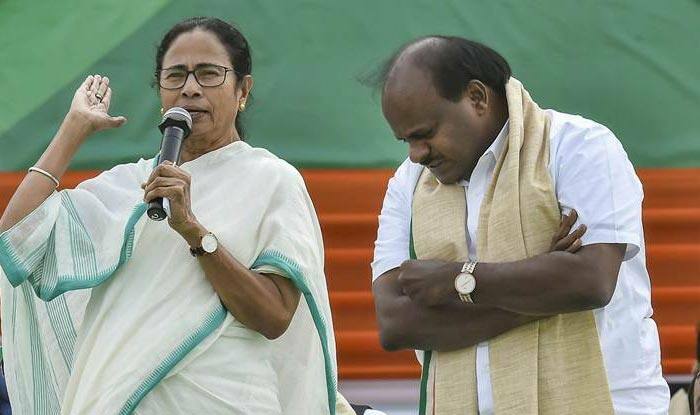 Kumaraswamy, who was part of the Trinamool Congress-led mega opposition rally — United India Rally – held in Kolkata on Saturday, also said that Banerjee has the abilities to run the country. “She (Mamata) is simplest of the simple and a very good administrator. I believe that Mamata ji has all the capabilities of leading the country. And she has already proved herself by leading West Bengal for so many years,” he said. Drawing parallels with the situation the country in 1977 when Prime Minister Indira Gandhi faced revolt from various quarters, Kumaraswamy said, “The present scenario is quite similar to that period. Even the politicians sat together and select their leader. This time, too, I think we will also have no problem in doing that.” The Janata Dal (Secular) leader asserted that the Mahagathbandhan would be “an alternate to the national party”. “Several states have their own problems. Each of them have regional leaders who are as strong as national party members. And these regional parties will play a crucial role in the elections. This time people are going to bless them.,” he added. Talking about the absence of Telangana Chief Minister KCR at the mega rally called by Banerjee, Kumaraswamy said, “I think after the elections everybody will join. Everybody will come together. I am quite hopeful.” Incidentally, KCR had came down to Kolkata to meet Banerjee last month for a discussion on the grand alliance. He, however, stated that his efforts for a non-BJP and non-Congress alliance would continue.